A few months ago, I located a book that was very near and dear to me - John Ankenbruck's 1975 Twentieth Century History of Fort Wayne. When these limited edition books came out, my mother had purchased a handful of them for people like my grandparents and her sisters. Sadly, our own copy was lost in that fire I just referred to in my last post. I never thought I would locate another copy. Thank gawd for eBay. Thank gawd for greedy re-sellers :). P.S. I'd like to thank Judge Jackson for my Ankenbruck book - it was given to him (as inscribed on the inside cover) by Charlie Pratt, Christmas 1975. What I loved so much about Ankenbruck's book, was the massive amounts of details about how Fort Wayne evolved from the beginning of time. In between the oodles of details, were informative pictures of our lovely city. They were all black and white and even in 1975 - when I would spend hours reading through this book - I was amazed at how much Fort Wayne had changed. Truly, if you were ever going to build a Trivial Pursuit card game around the history of Fort Wayne, John's book would be the place I'd start! Gosh - but I'm feeling really old right now! One might think - okay - if I have Ankenbruck's book, what in the world does Bushnell's latest offer me? Oh yes, it's a beautiful, coffee table-like publication. And I haven't seen a duplicate yet (of what was in Ankenbruck's gi-normous volume). That's cool. But what really made this book stand out for me was Bushnell's approach of storytelling and then, the selection of photos he uses to support his style of relating the history of Fort Wayne to the reader. You see, he doesn't bombard you with the Trivial Pursuit knowledge. (This is a good thing btw). 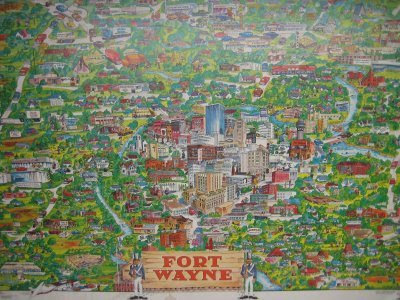 Instead, he fluidly leads you through the significant periods of Fort Wayne's life and times. The photographs (which cover the mid/late 1800's through the late 70's) were mesmerizing. For the most part, they were preserved and printed as is - and frankly - that's hugely amazing to me. Side thought: I think that many of us have an appreciation for great photography. Is that an appreciation that these photographers (or picture-takers? or historic documenters?) had or is it just coincidence that they produced show-stopping images of our past? My favorites (in case anyone is asking) are on pages 6 (St. Paul's Catholic Church), 28 (Lake Shore Hotel), 47 (Young Men on Bike's in Swinney Park), 66 (Alt Heidelberg Hotel and Cafe), 102/103 (Wayne Knitting Mills annual outing), 122/123 (Lady Wayne Chocolates League Team), 162 (G.C. Murphy's), and 195 (200 Block of Columbia Street). Today's BLOG title is brought to you by a song by one of my favorite artists - Michelle Branch (You Get Me). Let me just lay it out here. I admit to not being understood (generically). Many people don't "get" why I have such love for my childhood city and they are baffled by my fascination with history. I'll offer some insight which may or may not help. History didn't mean anything to me until I was 18 years old. That's when every single possession of mine - photographs, baby book, baby booties, dance outfits, class pictures, drawings, toys, letters - was lost in a fire. In particular, I had one special box (I put it together right after my parents divorced) that stayed with me from the age of 12 up until the time that house burnt to the ground. That box was a snapshot of my life - it had things in there that reminded me of who I was. It may sound silly, but that damn box grounded me whenever I felt like I couldn't take another set back in life. Everytime it was "time" to pack up and move yet again, I just looked at my anchor and reminded myself that tomorrow would be a better day. So after this fire happened, I started looking at many things much differently. Kind of a layered approach. Didn't mean to - not on purpose...it just happened. People and places and things had multiple meanings to me. When I see photographs of people, places, things (mostly that I have some familiarity with) - I'm generally emotional. I don't breakdown (gawd no! ), but I absolutely feel....and the feel is internal. There's an acknowledgment (in my heart and in my head) of sorts - sometimes a learning...sometimes an appreciation....it's hard to fully explain so I'll just stop right there. Yeah. I know. I'm weird. But remember, when I talk about Scott's book in another post, I'm a FREAK for a reason :). Thanks to Beth for reminding me of this little diddy. Beth, yes - I do remember Mike, the Talking Bike. A quick search on google yielded some good memories. Personally, I could never look at my light green, banana-seated, floral-basket hangin' Schwinn bicycle the same way again. I wanted to know - HOW COULD I GET ONE OF THESE?! BTW - If someone from the Fort Wayne Police Department has pictures or more info on what happened to our "Mikes" (the good Schwinns who visited us within the walls of FWCS in the early 70's) - at least a handful of us would like to know :). Alright. I can't help myself. YouTube can be somewhat addictive and here's some more proof of that. Every year in elementary school, we always had a handful of 'guests' come out and visit us for some unique purpose. One group who visited us (was it EMS? was it a group from one of the three hospitals?) went over the importance of staying away from harmful, household-related items. Remember Mr. Yuk? Goodness. How could you forget him? He was the poster child for all things POISONous in your household. When this group came to visit, they'd bring along the movie (8 mm film in the canister), along with lots of warnings and merchandise (in the form of green, ugly Mr. Yuk stickers) to boot. My sister and I would race home that day and label as many things Mr. Yuk as possible. This included foods that we didn't like to eat too. Our parents really hated those stickers. My mother grew up with the Original Mickey Mouse Club and in 1977, Disney decided it would be a good idea to have a version of this show for the kids of those kids. After holding a lengthy audition process, they selected a dozen or so kids who were not only talented, but also represented the diverse background of the intended audience. If my memory is holding up - I *think* that WKJG carried this on their line-up (channel 33). The most recognizable kid from this year long Mickey Mouse Club was Lisa Whelchel. She went on to the popular sitcom, Facts of Life, and then later, became wife/mother/author who wrote/spoke about the influence of religion in her life. My favorite mousekateers were Julie, Kelly and Todd (he was a cutie!). I found this clip on Youtube - hope you enjoy the memories! I started out as a music major in college. I wandered around, stopped attending classes (nothing I would recommend - as it constitutes a "flunking out" black hole on your transcript), sat out, enrolled elsewhere, and came back to where I started - IPFW. When I came back - heck - I didn't know what I wanted to do. I just knew that I needed to get a degree. Also, I wanted to take courses that would not bore me to death. After all, interest was key for me and that attend-your-class- thing. After inhaling the "bulletin", one of the classes I settled on was an Introduction to Supervision. Boss people around...CHECK! That's something I was interested in :). My professor was David P. Swinehart. Now Swinehart - he wasn't outgoing and vivacious. He wasn't loud and obnoxious. He wasn't flashy. What he was though, was thoughtful, insightful, and interesting. He was most excellent at bridging the classroom with reality. He was a good storyteller (the stories we heard about his time working as personnel director for Mayor Lebamoff - yowsa!). He was a good listener. After taking his class, I decided to major in Organizational Leadership and Supervision and Professor Swinehart became my "official" advisor. He was frickin' awesome because he got me. I think this was because he was a Libra (something which he used to laugh at when I brought up) . Regardless, Swinehart used his practical/pragmatic approach to keep me focused on the prize (i.e. get your damn degree already). He was honest and truthful (in a non-slam-on-your-fellow-colleague-way) about who were the best instructors (caveat: for ME). I took classes from Pat Ashton and Bill Bruening because he said so. I stayed away from classes with "X" and "Y" because he said so. It was a good advisor/advisee relationship. As time went on, Swinehart's availability became more limited because he was attending Law School at IUPUI (in the evenings). Literally, he would drive to Indy several days a week just to attend class. Dedication!!! And the next part of the story should be - and they lived happily ever after....right? Well no. Sadly on April 20, 1991, Professor Swinehart died at Parkview Memorial Hospital. It was quite upsetting and shocking for many of us and OLS was never the same. It was upsetting for me that he never got to see me earn my first degreee - and lord knows - the man pestered me enough to be there to see it happen! The good news in this tragedy is that the students and faculty from OLS came together and created the David P. Swinehart Memorial Scholarship. "This scholarship is given to an OLS major who most exemplifies Swinehart’s outstanding qualities of leadership ability, high academic performance, service to the school and community, and career development." Seventeen years later - his legacy continues and if you're the lucky recipient for 2008 - know that this wasn't just some anonymous, scholarly, old-fogie, who pontificated from his tower about theories and what-if's. This was a man who left his mark on the world. P.S. Who knew that way back then, one silly little intro class would have been the pebble that rocked my world - aka change my destiny forever? Say hello to my first grade class from Indian Village Elementary School. The year (according to the picture) is 1973 and Mrs. Marci Lawson is the inspirational teacher - keeping us all in check. We were located in Room 19 (yes I know - scary that I remember this). Our desks were simple, in a complicated way. They weren't the fancy ones that opened up on top. Oh no! They were the kind that opened up to your waist area. Many things could get lost (and subsequently - GROW) in this area. Emptying these types of desks out at the end of the year was always an anxiety-filled moment because one never knew what people like Brian Blazer and Ralph Barva would pull out of the nooks and cranies of these wooden hothouses. 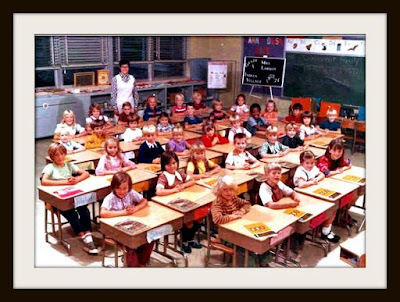 If you attended Fort Wayne Community Schools (the elementary ones) in the early to mid 70's, I bet your class pictures looked just like this. Every year, the photographer would come into our classroom and he would bellow out instructions to our teacher that went something like this. What he meant was that the lens was only so wide and therefore - if the desks were required to be in the picture (by the way - I'm still trying to figure out who made this rule) - then - in order to get everyone in, we had to move all of the people and desks into a small area, sit behind them, and smile for maybe 3-4 shots. In other words, it took much more time to move the desks around then to actually take the frickin' picture. The boys really liked to scrape the desk chairs as hard as they could across the concrete (but hey - it looks "tiled" - floor). I have a ton of great memories from first grade. My first grade experience was extremely profound and I can't even begin to tell you how lucky I was. I think I was just in the right place, at the right time. Anyway - there will be a lot more to write on this subject of first grade. But for now, let's get scary for a moment. I remember just about everybody's name. So here it goes. And if I'm missing someone, or if I have spelled their name wrong - please let me know. By all means, if you know where any of these folks are today - let us know! Row 3: Ralph Barva, Wendy Shipley, Tracy Nimbles, Betsy Barrett, Kelly Miller, Billy ?, ? Row 4: Eric Busenbaric, Brian Blazer, Kelly Biddle, Lisa Smith, Tom Stinson, ? Back in December, when I decided to start this blog, and I found myself spending oodles of time surfing the web - that's what I came across the web site for the Indiana Historical Society. After reading a tagline like this - how could a person resist signing up for a yearly membership? Well, I couldn't and so I did. By the way - you can find them here - and membership is relatively inexpensive ($40 for individual). One of the neat things about membership is that you can opt to receive some of their publications. For example - Traces (of Indiana and Midwestern History) - an "award winning" history magazine published quarterly by IHS. It came in the mail today. On the cover - Indiana's Lincoln - and on the inside, a 15 page story about Lincoln and his roots in Indiana. Written by Ray E. Boomhower, it is a most excellent article - which includes drawings and photographs and maps - related to Abe Lincoln. Yes folks. Four days later, I'm still ticked off (or as I like to call it - I'm still experiencing cognitive dissonance). Just goes to show that I feel strongly about a company that used to represent integrity and at least the 80/20 rule of honesty. I'm waiting for the next press release to say, "Lincoln Financial to Make Jobs More Accessible and Visible". You know what it will say - hidden within multiple paragraphs? The Lincoln Financial Group embodies the principles of Abraham Lincoln who once said, "I am for those means which will give the greatest good to the greatest number." By collaborating with other cities, the Lincoln Financial Group hopes to make jobs available to a greater number of people using Abraham Lincoln's bicentennial as a catalyst. Through invitation, the Lincoln Financial Group will host a national informational session with potential partners in late March to provide an understanding of "possibilities" and "needs" and, in turn, discuss options for increasing visibility. In other words - you must come with at least one, highly visible pro and/or college athletic building which will bear our name. The Lincoln Financial Group has operated in Fort Wayne, Ind., for many years, however, after giving our best possible CEO - Ian Rolland - the shaft - we high-tailed much of our operations to Philadelphia and over time, we intend to re-write history to show that this company actually originated in PA - and not in IN - as it currently reads today. As a result of this new strategic direction, The Lincoln Financial Group will eliminate as many jobs as they want - but only at the Fort Wayne location - whenever we want - but hopefully by June 30 so that we can close our books "appropriately". End Note - Posted on the Journal Gazette website is an excellent editorial by Harold Holzer. I know I've posted (to the side) a list of photos that I'm looking for. I'm looking for a handful that are residential in nature (instead of business). 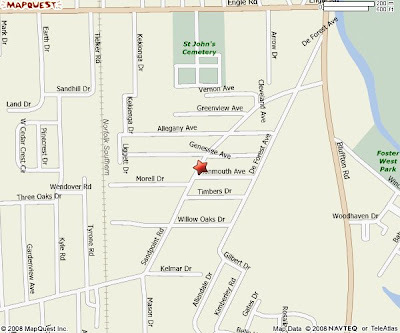 My grandparents lived in the following residences - and I have no pictures of these. I don't even know if they are still standing. If you have these or can take photos of these for me - I'd be forever indebted to you. NOTE: Special Thanks to Christopher for letting me know that this used to be called "Andy's". There's a specific memory from childhood that is as clear as day. 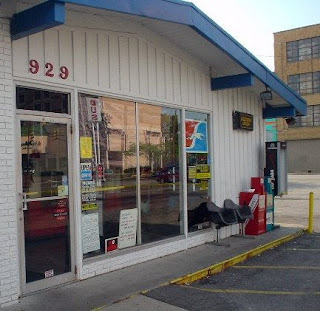 We continued on Sandpoint Road - passing another side street or two (or three) and on our right, was a - well - a "mom and pop" place - almost like a gas station grocery store, but I think it only had one pump and I don't remember the name of the place. So here's where I need your help. What was the name of this place? Does anyone have a picture of it? I'm assuming it is no longer there - but can someone verify that? So why did we travel such long distance (it was about 3 miles round trip)? Because - this place had grab bags - the coolest, ultimate, greatest grab bags which contained candy in them. The bags were an ordinary brown kind, filled with penny candy, and stapled. It was great - you never knew what you'd get! I believe you could could choose from ten cent, fifteen cent, or twenty-five cent bags. Sometimes, in the 25 cent bag, you might even be rewarded with a dime! And that meant - you could buy another bag. Seems kind of anti-climactic, eh? Not for us it wasn't. And get this! There wasn't any chocolate either. It was all hard candy and gum. 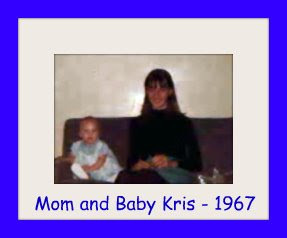 There was a short period of time when my grandparents lived away from us - in Jackson, Michigan. I don't know the exact dates however, sometime in the early 70's rings a bell for me. I remember the economy not being all that good and my grandparents moved out of town for some job that Grandpa had accepted at a place called the Wayne Box Company (?). 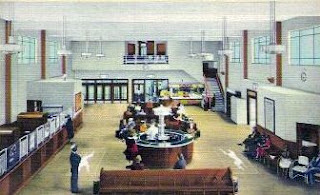 The Greyhound Bus Station was gorgeous...its 1940's art deco architecture was quite unique - but as a child who was probably 6 or 7 years old at the time when I visited the place the most - I took its beauty for granted. 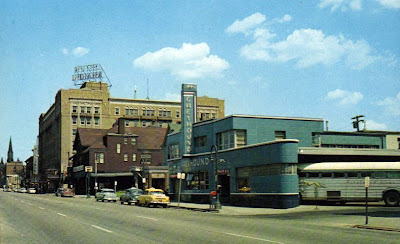 Located on Berry Street, the Bus Station was a cool place for a kid like me to hang out. 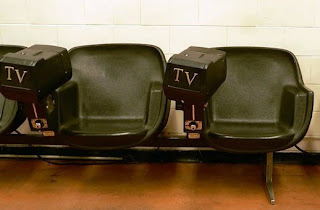 If I could cajole some loose change from my parents, I would sit on the plastic chairs with those tiny television attached and carefully place my coins inside the silver turnstyle - full of anticipation for when the television would magically turn on. The television stations were of course - the same ones we got at home (15,21, and 33) but being able to have it there...attached to a public chair - WOW! What a huge treat for a kid!!! Sure, you had to click on dial but you had to do that at home too. And sure, it only stayed on for about 20-30 minutes but hey, that was okay too. When we didn't have the change to watch the televisions, my sister and I would run up and down the stairs, chasing each other across the open areas of the terminal. There was lots of echo to be had and in place that didn't frown on loud noises, it was nice to be able to yell, hear your voice bounceback - and all - in the presence of your parents who didn't yell at you for it. As each bus would arrive, a voice would come over the loud speaker announcing its presence. I loved looking at the buses. They weren't like the ones that we rode to school in. These were HUGE. If you were sitting in one, it was like sitting on top of the world. The buses (which I would ride myself a few times in the 70's and even twice in the 80's), were air conditioned... HUGE DEAL to us chicks who didn't have air conditioning in either our parents cars or houses. There was also a bathroom too! The buses would pull up in a diagnoal direction and when their grand doors opened, it was a spectacular event. The driver, all dressed in his crisp uniform, would exit the bus and proceed to the side (opening up one of the silver side doors where additional luggage was stored) as the passengers would step down to greet their family members. My grandparents were always towards the front - I guess - so they could stay away from any of the riff raff :). It never got old seeing them step down from those bus stairs. I would run into the arms of my grandma - who always smelled like ivory soap. Her skin was soooo soft and her hair was red and shiny.My grandpa always smelled like his cigars (which in a bizarre twist - I never minded - in fact - I came to like the scent very much). 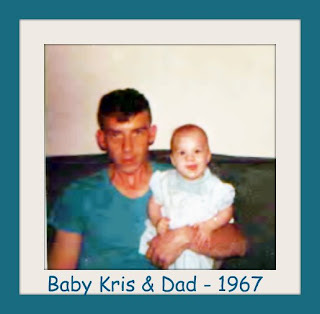 He would always give me a quick squeeze but he knew that I was grandma's girl and that she and I had some very serious hugging to do (which we proceeded to do - in the car - on the way home - I sat on her lap). My grandparents would stay at our house for about five days at a time. Eventually though, they had to return and the trip back to the big blue building on Jefferson Street was something I never looked forward to. Saying goodbye was hard hard hard. 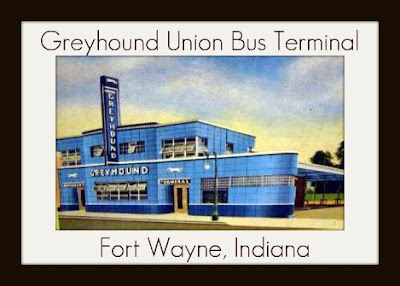 So as many of you know, the Greyhound Union Bus Terminal in Fort Wayne, Indiana no longer exists. It was torn down in the 80's (had sat vacant for years prior) to make way for new construction efforts. It's sad that a building which held so many memories for so many families in Fort Wayne - fell by the way side - and was scrapped for new construction. If it had only fallen under the historical society like the baker street depot - wow - we might have something cool - a restaurant - some other entertainment facility within those art deco walls today. 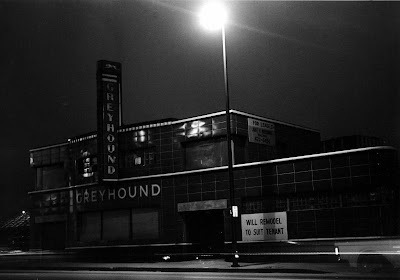 Greyhound relocated to a different facility - to an old gas station facility located at the corner of Berry and Clay (across from City Glass?). One of the reasons that I focus on the past (as it applies to Fort Wayne) is that I'm completely heartbroken over what has been deemed "progress" over the past 15 years. Do you remember this map that was released in - oh - the mid-70's? I only have a small version to post here - but the one I have on this person is a fantastic animated/illustration of the businesses that were a strong force - a huge contributing factor - that made Fort Wayne stand out from all of the other big-little cities. And then last - but not least was a little ole force to be wreckoned with - Lincoln National Corporation (now known - I guess as Lincoln Financial Group). LNC was a fantastic place to work. My husband and I BOTH worked there. It was just an all-around, great place to work. Why? I think much of it had to do with the leadership and grace of Ian Rolland. I still have major hero worship for the man today. He knew how to lead people. He knew the importance of giving back to the community. He knew that although the bottomline was important - have faith in your people - and they will build up your bottom line. I worked at Lincoln for about six years. I always thought that after I was done with Central Indiana, I would make my way back up to the Fort and LNC would be my last place of employment before I retired. Obviously, I was deluding myself. The leadership team high-tailed it to the East because as we all know - it's way important to have your name on the side of some sports stadium. They outsourced IT to IBM - which is completely - well laughable because LNC had one of the best IT groups that ever walked the face of this earth and to dump them down with the likes of the Big Blue - well - what an insult. As an aside - very ironic - isn't it? To outsource IT to a company that charges a bazillion dollars to do consulting work for large companies like LNC/LFG. It's like we sold our talent to them. And then they turned around and (most likely) charged LNC/LFG triple. Who knows if this THING still exists - it's probably been even further outsourced. So I'm outraged at the moment because I just read on the Fort Wayne Newspaper site that those idiots are closing down The Lincoln Museum. "The Lincoln Museum downtown is closing, it was announced at a press conference Monday by the Lincoln Financial Foundation. The decision came in part because of decreased student traffic. The foundation said about 12,000 students went through the museum in 1996. Only about 7,500 did in 2006. The foundation said competition from more hands-on offerings, such as those at Science Central, had hurt business. One or more organizations will take over possession of the museum’s 79 “3-D” pieces, such as a chair in which Lincoln was photographed. It is not thought that any of it will remain in Fort Wayne. Some of the print items, such as a copy of the Emancipation Proclamation signed by Lincoln, will be digitized and may stay here." I heartily congratulate the idiot management team of LFG (insert golf clap here). Way to show your continued loyalty to a city that you once felt a deep commitment too. Let's start the countdown on how long it will take you to dismantle everything else that was once lovingly built and nurtured in this town by your predecessors and those who stood side by side with them (aka the fine folks of The Fort). Twenty years ago today, you drew your last breath. I didn’t want to be there. I couldn’t watch you anymore. You were out of your head – literally. Not the man who introduced me to Dairy Queen Blizzards. Or Colby cheese from The Mouse House. Or who smoked cigars with the funny-gypsy-looking lady on the box. Over a very short period of time, you became something that we are all afraid of becoming. A man trapped inside a body which is physically disabled and cognitively empty. I know you know that’s why I couldn’t be near you then. Gosh. Even today, when I stop to write and acknowledge this event which happened half my life ago - the grief comes - floats up from some place not that far away. 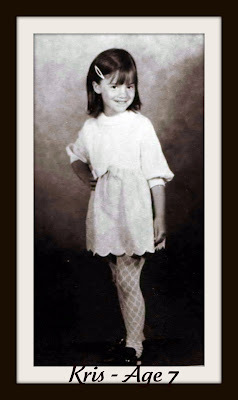 I'm still so very angry - at you - at God - at my mom, my dad, my aunts, my friends, my grandma - at the world. I'm angry with myself for not appreciating you as much as I should have. For not soaking in as much of your wisdom and your everyday goodness. The aching pain in my heart knows no bounds. Although I'm really good at containing it. 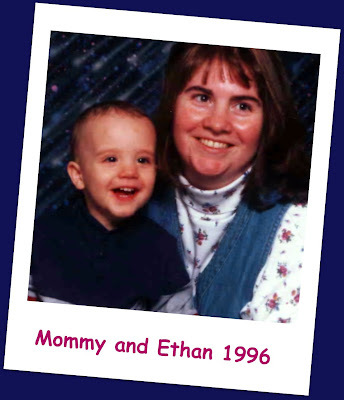 Squeezing it into a teeny, tiny corner, hiding it from the world so that they don't realize that twenty years later, your absence still affects me like this. I tried to save you the best I knew how. All the memories come flooding back to me - Paranoia. Forgetfulness. Short-temper. Falling. Napping. Not making it to the bathroom on time. Me coming home from working one of my many jobs and grandma telling me that you were at the hospital because you had fallen. That was two months after I stopped telling people that you were sick. No one believed me. Or maybe I should say, no one wanted to believe me. Your diagnosis came quickly. The day of surgery is still as clear as day for me. Dr. Kashman came out and said that the tumor was big, cancerous, and deadly. I ran around to the first hall I could find and I sobbed uncontrollably. Noooooooooooooooooooo. I couldn't lose you - the only stable, male role-mode/figure in my life. And it was SO unfair. And I was tired of life being SO unfair. My last meaningful conversation with you wasn't meant to be so meaningful. I didn't think you were lucid. You were plenty doped up. To me, you were already gone. Which is why I just broke down and confessed to you how much I loved you and how broken my heart was and how angry I was and how I didn't believe in God anymore. Shakily, you grabbed my hand when I wasn't noticing and you said - I don't ever want to hear you say that you don't believe in God. My tears stopped for just a moment and I searched your eyes - was that really you talking to me? I lay my head on your chest and you touched my hair. I listened to you fall asleep and I knew that this was the last time that you and I would ever talk as grandfather and granddaughter.